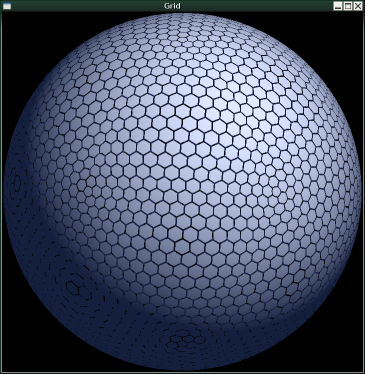 IcoGrid (Icosohedron Grid) is a haskell library for generating grids of hexagons and pentagons wrapped around a sphere. The grid is layed out as twenty triangular hexagon grids fitted together to make an icosahedron. The points where file of these triangular grids meet are pentagons. The size of the grid is length of one of the sides of the triangular grids. Thus a grid of size S will have approximately (S^2)*10 cells. Most of the library functions require the grid size as the first parameter. Cells are identified by integers from [0..N-1] for a grid with N cells. Functions are provided to generate a list of all cells, a list of neighbors to a particular cell, a list of "triads" to which a cell belongs, and a list of all triads. A "triad" (my own terminology) is a group of 3 cells that meet at a point. Another useful function takes a cell ID and returns a vector, which is the center of that cell, as if the whole grid were mapped to a sphere centered at the origin with radius 1. A function which I have not implemented is the reverse function, which takes any arbitrary point and returns the closest cell. I expect the easiest way to implement such a function efficiently is to sort the cells into a bounding volume hierarchy of some sort, then look up the point (after normalizing it to lie on the surface of the grid) in the BVH to get a small list of candidate cells, and then search the candidate cells for the closest one. The cells aren't quite a uniform size. This page was last modified on 24 January 2010, at 03:35.